I really like Thunderbird, but one of the things that always bothered me is that as soon as you use more than one e-mail address, it becomes terribly cluttered. Every e-mail address gets an inbox, a trash, a drafts folder – it’s just not pretty! 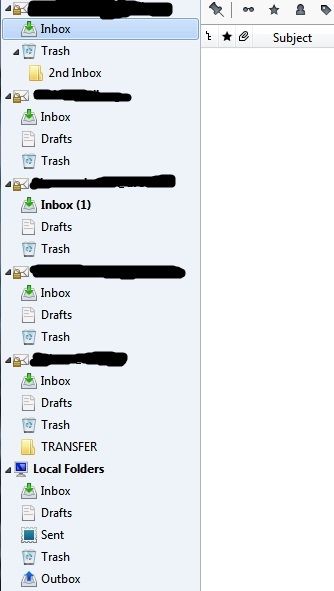 Then there are the Local Folders, which are somehow different, there’s an outbox, there’s really only one folder that keeps my sent e-mails and it’s never the one I expect it to be. 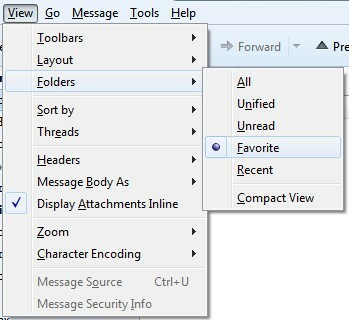 Also, I have a system in place that filters all my emails to a special second inbox. This is my way of reading all my important e-mail quickly, without having to select all the different e-mail addresses I use. It’s also a way of filtering out the spam that passes through my spam filter. If I know you, I’ll have a rule for you that will move your email directly to my second inbox. If I don’t know you, you’ll spend some time in my regular inbox first and I’ll deal with you when I get around to it. There are also newsletters of low priority, like the newsletter telling me if an artist I might like performs anywhere near me. Most artists I like don’t sell out quickly enough that waiting a few days would make any difference. Mark the folders you want to see. 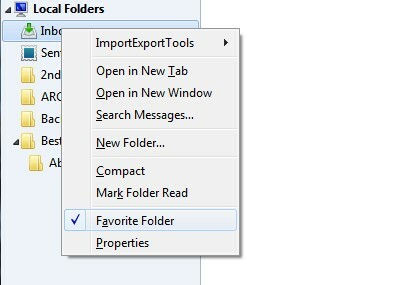 Right-click on a folder, then click on Favorite folder. 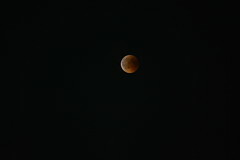 On the top navigation bar, click on View => Folders => Favorite.